This is plate 16 from James Fergusson's 'Ancient Architecture in Hindoostan'. Built on a steep hillside of the Vindhya range, the town of Bundi was the capital of a Rajput state until it succumbed to the Mughals in 1658. 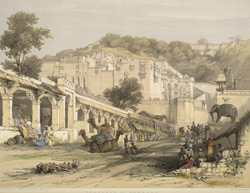 In Fergusson's sketch, the street of the principal bazaar is in the foreground, leading to the gate of Bundi Palace. He thought the street "one of the most picturesque streets of Malwa, and some of it of antiquity". He did not see the interior of the palace, but he thought the exterior a "combination of forms ... as pleasing a piece of architectural scenery as I have seen anywhere even in India, where such effects are common." The different buildings of the palace were built between the 16th and 17th centuries, examples of fine Rajput-style architecture. Bundi was a centre of Rajput painting, and the palace's Chatar Mahal and Chitra Shali are decorated with traditional murals.